I have a 2000 SLXi my pump is going out as well. The pump is louder than hell. I'd be interested to see what you hear on this board. You can buy a pump from summit racing or jegs much cheaper. Wire it up yourself. Just need the right specs. There are some threads on here as well as the mastercraft site about doing that. Somewhere on here I read that the Carter P60962 was a "direct" replacement for the Indmar 556014 pump...BUT they don't product that one anymore but if you find it, it's a direct replacement. Soooo, this thread says that this pump is compatible, except you need to make your own Y fitting. Probably not very tough. Only reason I follow this is that if/when my pump goes out, my choices seem to be the the one I just showed you, the Bakes conversion, or an in-tank conversion (around $450.) Please let us know what you do and post pictures if you do the Y fitting or convert. That pump looks interesting. The Y fitting isn't really necessary unless you have the 2nd low pressure booster pump located at the fuel tank. The Y give a fuel return path from the 2nd pump, so you could just block it off. I replaced my pump a few years ago when the original was still available, but if I have to replace it again I think I'll try this one. The fuel pressure is low at KOEO (32 psi). This could be caused by a bad fuel pressure regulator as well. IIRC < > I understood from Paul at Bakes that low fuel pressure meant a bad pump and high fuel pressure meant a bad fuel pressure regulator. The new fuel pump conversion looks expensive, but if the conversion lasts more than 2-3 seasons you will be way ahead of the game over the oem pump. I did check the reg. and it passed the fuel pump had 52 psi and would spike to 85 dead head, but when you did a flow test pressure dropped to 30 psi. I installed aftermarket pump for $200 and has been working fine. I've been reading several threads all over the place regarding the conversion kit listed above, but have yet to find info from anyone that has actually completed the conversion. Local shop is telling me that the new bracket with the kit has a place to attach the second hose, as the original pump had two out the bottom of the pump. At this point I'm not interested in going a different route with the other pump mentioned above that I'd have to add a "Y" to. Would like to go ahead with the conversion and hope this one lasts longer than the 2 seasons I was getting out of the original. Have already ordered the conversion kit indmar part number 495117 which replaces OEM Indmar 556014. Again, would love to hear from, and even see pictures from anyone who's done this conversion. For me this will be installed on a 2000 Malibu Response LX I believe with the Monsoon engine. I am interested in your review of install and afterwards. I have blown thru a fuel pump every two years as well and hope this conversion is for the better. I will definitely update with install info and review if I can figure out how to get it installed. Hopefully someone here has done it and provide some guidance. If not I'll give it a shot anyway. No need for a Y. You buy a pump from summit for 100$ and a plug for your bracket. Return line then dumps to tank not back to pump. I've got 50+ hours on this set up. That makes sense and the more I look at it the more I assume this new conversion is supplying some type of plug as well. Mine has a metal pressurized line that was attached to the second port at the bottom of the original. Did you just plug that line? Any pictures of your setup? I've already ordered the more expensive conversion but I'd still like to see what you have. The conversion comes with a new bracket that holds pump. The bracket has no return to pump hardline just goes straight to tank. That's the hole I plugged on my bracket, the new one doesn't need a plug. I'd post a pic but malibucrew doesn't want to pay for storage and Photobucket isn't hosting the images for free anymore. Pm ur email and I can send some pics. Perfect. Tempted to cancel the order and save $300+, but I think I'll go ahead with the conversion. If it doesn't last then the $100 method will be a no brainer. @bozboat you are the greatest, thanks for lending a helping hand! Thanks for sharing this info. Were you able to use the existing wiring harness? Yes. The new pump only has one inlet. So plug the hole on the bracket and the return dumps to the tank. Inspect your harness, mine was burnt a lil, so I replaced it. A new harness comes with the summit carter pump. how does the return dump back to the tank? 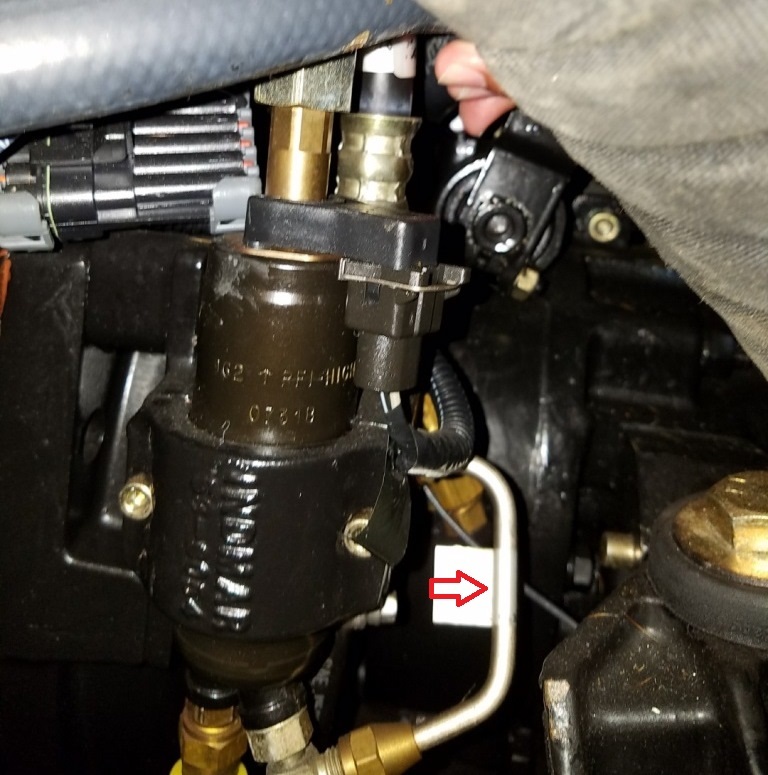 If the original configuration returns to the bottom of the fuel pump, and I plug that, what do I need to do to get the return line to dump to the tank? I think I have two hoses from the tank already, one is a return line? Which pump did you buy? And where? Hope I dont need one, but I might. Did you have the 2nd connection at the bottom of the pump?